Weight gain or loss is generally an issue both during and after times of elevated stress. Heightened stress levels tend to cause imbalances in hormones like cortisol, DHEA and adrenaline. Increased stress stimulates our adrenal glands to produce excessive and inadequate amounts of these hormones. When stress subsides, hormone levels should stabilize, but occasionally the irregular hormone levels remain in tact for long periods of time, often having negative effects on our bodies. Cortisol has an intricate relationship with the hormone insulin, which controls our blood sugar. When cortisol levels increase, the cells of our body can become resistant to insulin. In turn, this may lead to an increase in blood sugar, weight gain and potentially Type 2 Diabetes. When cortisol levels drop excessively this is known as adrenal exhaustion. If this occurs, blood sugar levels may decrease, causing hypoglycaemia, linked to weight loss and a low stress tolerance. Both high and low cortisol can also trigger symptoms of low metabolism such as feeling fatigued, depressed, cold and experiencing decreased memory and poor concentration. To a large extent, cortisol levels also facilitate optimal hormone production from our thyroid gland. Proper thyroid function helps to maintain a healthy metabolism, but both high and low cortisol levels can impair the conversion of thyroid hormone from its inactive form to its active from. This can result in a low thyroid situation, causing weight gain and symptoms of poor metabolism. To properly address hormone imbalance, a number of tests are available. Blood tests for thyroid and blood sugar can help pinpoint any issues that may be causing symptoms of low metabolism. In addition, cortisol levels, and adrenal function in general, can be accurately assessed by naturopathic physicians through the Adrenal Stress Index (ASI). An ASI test indicates whether your adrenal function is excessive or deficient. 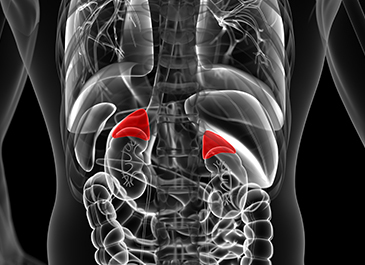 Since the symptoms of both extremes mimic each other yet require very different treatments, it is important to determine your individual adrenal rhythm. The ASI test requires taking four samples of saliva during a 24-hour period, which is examined to determine your hormone levels throughout the day. Once your adrenal rhythm has been determined, an individualized adrenalbalancing treatment plan can be prescribed and may include diet recommendations, lifestyle counselling and nutritional and/or herbal supplementation. Founder of Sage Clinic in Yaletown, Dr. Veeravagu can be reached at 604-697-0397 or info@sageclinic .com.